I swear my life involves a bit more than food, knitting, and my husband - I also have dogs. This past weekend I was up all night with my family playing cards and the girls were very insistent on being noticed during the game. The youngest is Minnie Moose a full-blooded English Mastiff and she is just about the tiniest Mastiff there must be in existence. And as I mentioned yesterday I also have a new tattoo. The mighty cupcake! This was designed by another family member and I am really happy with the design and the quality of work done. I love it so much that I feel a little sad that my cupcake stands alone - so stay tuned for added cookies! And Quin if you're reading this - I'll be back REAL soon. More pictures of the tattoo may be found on Flickr. This is the second tattoo I have done in the state of Ohio - I'm not originally from here so I am less familiar with area tattoo parlors. 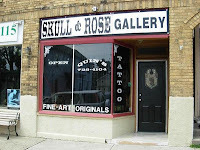 For this most recent tattoo I went to Quin's Skull & Rose Gallery just off the corner of Pacemont & North High Street in Columbus (Clintonville), Ohio. I learned about it from two of the ladies from my LYS. The glowing testimonial of "Go talk to Quin. He's a MINDREADER!" (-Karida Collins) was good enough for me. What to say about Quin. . . Quin has been tattooing for twenty-two years and honestly I was surprised to hear he's been at it that long because he doesn't really look quite old enough for that to be true. As a tattoo artist he is one of the two most gentle I have ever encountered. I found this somewhat soft-spoken man HILARIOUS. To further explain is difficult, he's very "it's funny because it's true." I had so much fun with him that I nearly forgot to pay him! How did he take this? Calm as a cucumber. I felt really bad (and confused how I'd managed to) for having forgotten but he was still so polite!